Since stepping out of the boat (the USA, a stable career, comfort, and safety) in faith to follow Christ on a journey that would lead me (Darryl) on the path to becoming a long-term faith missionary in Cambodia, most of the time since 2000, this passage has comforted me. I could also give more than 100 examples of this passage coming true in my life and with Kayo since our marriage in 2004 and arrival in Cambodia on September 11, 2007 with one suitcase and one computer case each. We are only where we are today because of God’s faithful provision and the sacrificial sharing of resources and comforts which we have received on both sides of the globe. For example, a couple of years ago when I was sick and needed to return to the USA for treatment, a beloved Christian couple hosted my family and I for three months in their two bedroom condo. During those three months, they insisted that we sleep in the king-sized bed in their master bedroom, while they slept on air mattresses in the home-office. They sacrificed their comfort to bless us so cheerfully that when we announced that there was another Christian house we could stay at, we almost got into an argument with them, because they wanted us to stay longer. If I could remember all of the blessings in detail, I could probably write a book by now. My new friend in P@k!$t@n is in the process of publishing this book in his country. Please pray for protection and provision for him. in his language, contacted me on October 3rd. He had already received some of my Christian Apologetics videos on a hard-drive, which he received from a mutual friend in the USA. 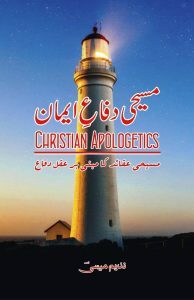 I sent him PDF English copies of my books, Christianity: Reasons for Faith and Christianity: Discerning Essential Doctrines and Preserving Unity. He invited me to come teach at an Apologetics conference in his country at some point in the future. We are in the prayer stage at this point but haven’t made any plans. Dwayne, Kara, Darryl, and Pastor Samuel. Sunglasses due to the new social score program which punishes citizens for religious activities. “Dwayne and Kara” came to Cambodia for their honeymoon. On the last Sunday of their honeymoon, they came to the free English class (even though their English is excellent) at the international church. I help teach this class the Ch!ne$e pastor at our international church. During the 90-minute class before the service, we teach English, the Bible (verse by verse), and I include relevant Apologetics evidence. 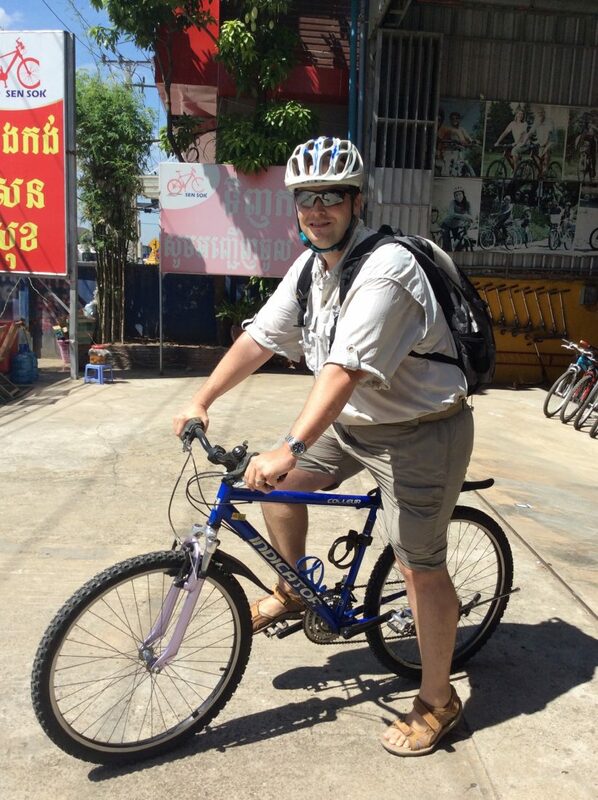 Most of the people are from Ch!n@, a few are from Cambodia, some are Christian some are not Christians…yet. Pastor Samuel has evangelized and baptized many people from his home country who first came to the church because of these English classes. Anyway, Dwayne and Kara attend a house church in their home country, which is pastored by Pastor Peter. Kayo and I met Pastor Peter in California in 2017, at the home of the same mutual friend who gave my new Apologetics Pastor friend in P@k!$t@n the hard drive which included my International Fishers Apologetics/Evangelistic Videos. 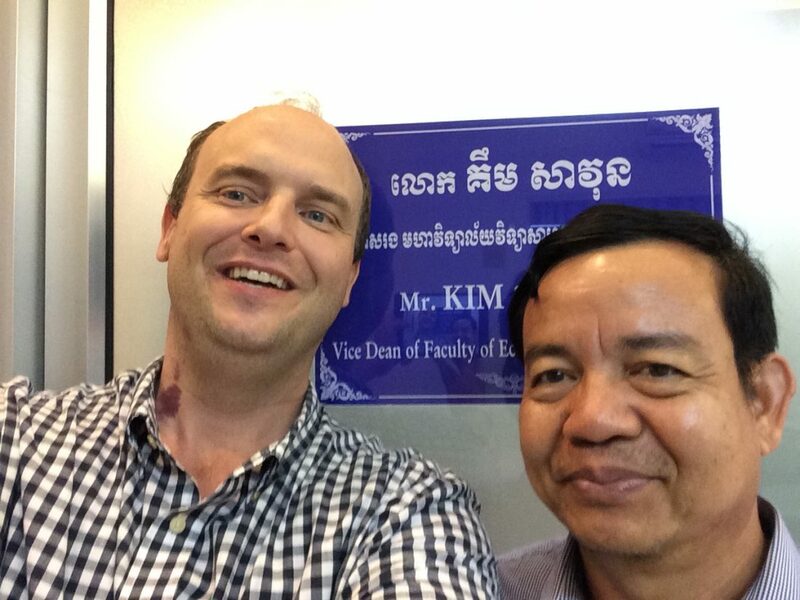 It turned out that Pastor Peter was a longtime friend of Pastor Samuel in Cambodia! 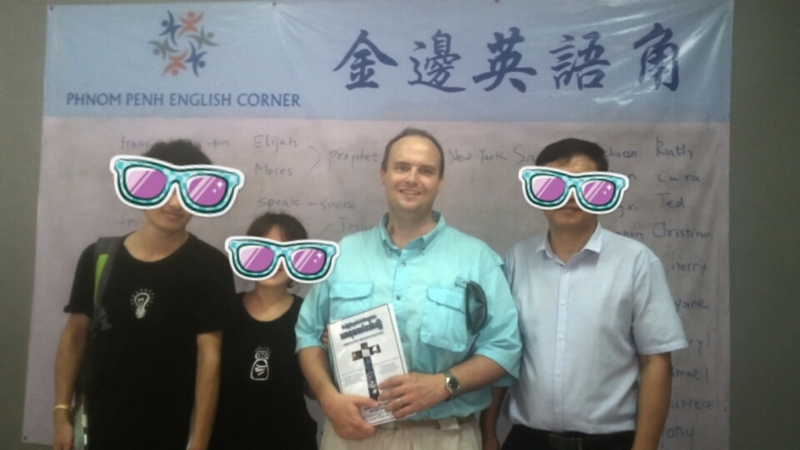 Benjamin, Kayo, and Darryl at the English Corner (Class) at the international church. 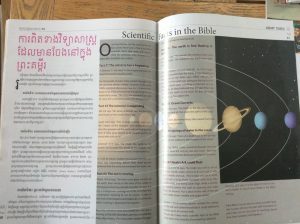 produce evangelistic/apologetics materials in the Ch!ne$e language based on some of the materials which I have already produced in English and Cambodian for my International Fishers ministry. So far, it has not worked out because Pastor Samuel and his team have been very busy with other ministries. Amazingly, Dwayne and Kara have a “underground” home studio and have been producing Christian audiobooks and music videos in their language for some time. They were looking for more evangelistic/Bible teaching/apologetics materials to contextualize, adapt, translate, record, and distribute to their people. 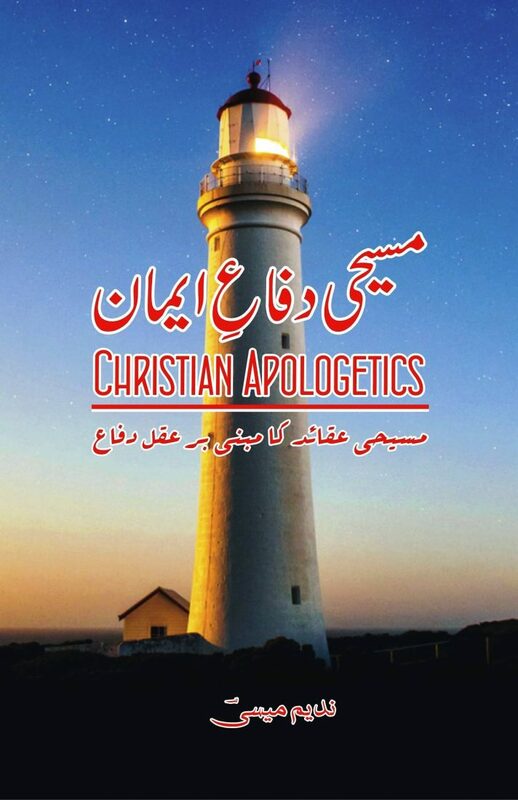 Darryl sent them with his Reasons for Faith book, the English scripts for all of his Apologetics videos, and the English Scripts for the 26 ten-minute episodes of the apologetics/evangelistic, Anchors of Faith radio program which he wrote for Far East Broadcasting (FEBC) several years ago. They also agreed to give Darryl and Pastor Samuel a copy of any materials that they produce so that we can distribute them both in Cambodia and via other organizations that minister in their country! Darryl and Sok Heng. Please pray for him in his current and future ministries. He has great potential. back in 2001, he took the Gospel to his village in the countryside. Many of his friends and family members got saved. One of his friends, Phanet, accepted Christ and worked at Kone Kmeng Organization for a few years. Now Phanet is married and is the pastor of a good sized church outside of the capital city. Phany’s older sister, Sampoa also accepted Christ during that season. When Kayo and I first arrived in Cambodia, Sampoa worked for us as a house-helper (going to the hot open-air market daily, cooking Cambodian food, helping with housework etc.) during our first two years in Cambodia, while Kayo was pregnant with Benjamin and when he was a baby. Sampoa also became a special sister, especially to Kayo. Sampoa’s husband hasn’t become a Christian (yet) but all four of her children attend church faithfully. The two oldest sons have mad strong professions of faith and been baptized. The oldest son, Sok Heng, only 18 years old, a recent high school graduate, is now leading a 50 person cell group (divided into 4 sub-groups with 4-assistant leaders)! This cell group is in the church where my old friend Phanet is pastoring. Sok Heng came to us because he needs financial support to help him apply for a scholarship to study at a Bible School in Singapore. After Bible School, he wants to continue to minister in local churches and then go to the university and study Political Science. His vision is to be a bi-vocational church leader/pastor and also work in the government or in an embassy. Since, Darryl considers Sok Heng as a Cambodian sister, “Uncle” Darryl is very proud of his “nephew” Sok Heng.” Darryl earned a BA in Political Science before coming to Cambodia as a missionary. When Phany was thinking about going into politics, Darryl and Phany had many long talks on the subject. Now Phany is in the process to being appointed to a high ranking postion in the national government while continuing his ministry with Kone Kmeng. Darryl shared a copy Christianity: Reasons for Faith and other videos and materials with Sok Heng to use in his cell group and future ministries. Darryl and Vice-Dean Kim Savun reconnect in a divinely arranged meeting after seven years. For Seven Years, When Darryl’s Phone Was Stolen. Darryl usually attends the International (Christian) Men’s Breakfast which occurs the first Saturday morning of the month. Before, the breakfast moved from house to house, but recently it is moved into its regular location in the apartment of John, an Indian-American missionary who also lives in our same apartment building. The beginning of November, Matt, the missionary from Canada who usually organizes it, and other main helpers were all out of town. 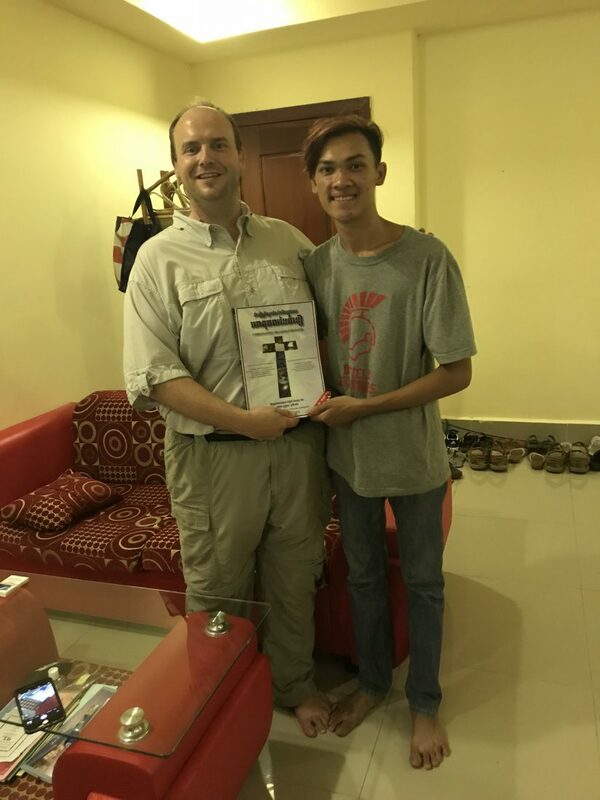 So Darryl, Garland (an American man, with a Cambodian wife, who Darryl met at church, who also lives in our same apartment building 😉 ) went to a local restaurant to meet Brandon, another American man who has recently come to Cambodia to be the country director for a Christian organization. 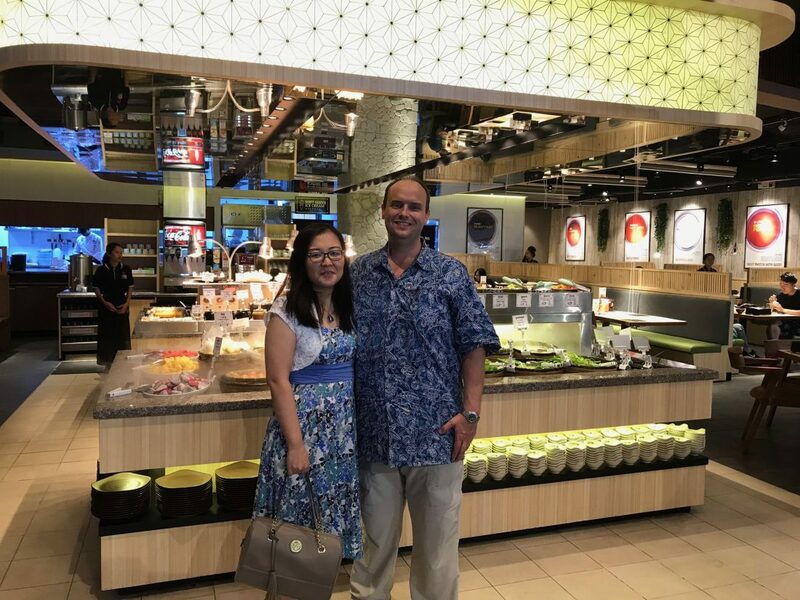 When Darryl and Garland walked into the restaurant, they met Mr. Kim Savun, who is now one of the Vice-Deans at the Royal University of Law and Economics (RULE), where Darryl taught English from 2000-2003 and 2007-2009. 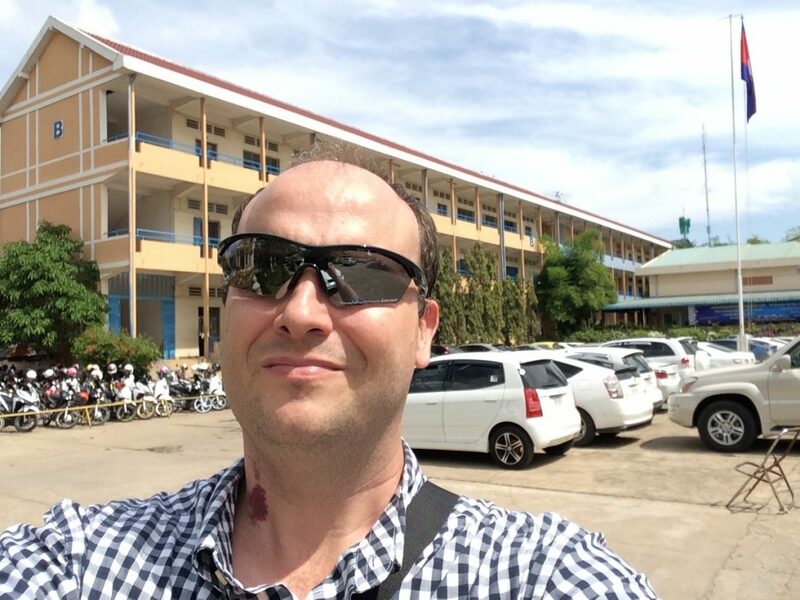 Mr. Savun has been Darryl’s supervisor and good friend since the day in August, 2000 when Darryl and his team of English teachers arrived at the airport in Cambodia for the first time. Savun and other administrators from the RULE met the team at the door of the airport and escorted them through the special VIP terminal (which the King etc. uses) and then made sure they got settled into Cambodia. Darryl, Savun, and other administrators at RULE stayed in contact, even after Darryl stopped working there as an Advanced English Instructor in 2009. One day about or eight years ago Darryl’s phone was stolen. Since he did not have their e-mail addresses or other contact information, Darryl lost contact with them. Because they worked at the big university, it would have been hard to find them, and life got in the way. God apparently, wanted Darryl, Savun, and other non-Christian Cambodian friends from RULE to reconnect, so he arranged for them to meet at the restaurant. Savun was there with his brother, a retired aircraft engineer. Instead of having, their planned breakfast for foreign men living in Cambodia, Darryl, Brandon, and Garland had breakfast with Savun and his brother. Darryl happened to have bilingual copy of his Christianity: Reasons for Faith Book which he intended to show to Brandon and Garland. Instead, Darryl could talk about the evidence for the existence of God, Intelligent Design, Creation, the Archaeological Evidence for the Bible, and the Evidence for the Life, Death, and Resurrection, of Jesus Christ. We all had a wonderful discussion in a very natural way. Mr. Savun’s brother, as an engineer, was very interested in the Intelligent Design evidence which points to a Creator. Darryl gave Mr. Savun the copy of the book that he had at the restaurant. supermarkets, and banks. 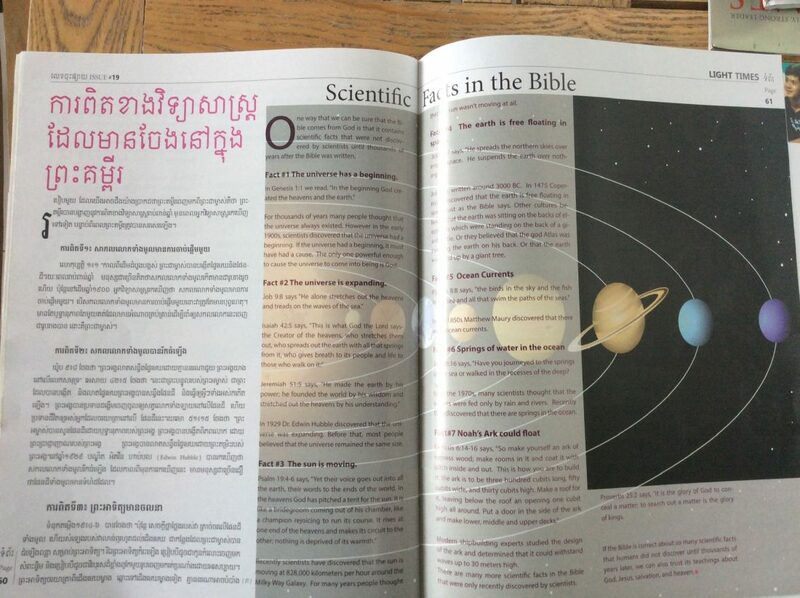 In each issue Darryl includes an Apologetics/Evangelistic article such as, “Why Does God Allow Suffering?” “Did Jesus Really Rise From the Dead?” and in the most recent issue, “Scientific Facts in the Bible.” Soksan, the founder prints and distributes 3,000 copies of Light Times quarterly. Many are placed in businesses, banks, hospitals, schools, and supermarkets around the city. They are also distributed to churches in the capital city and nation wide. 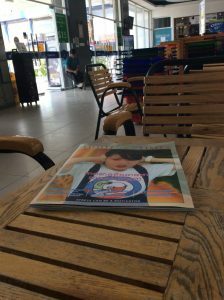 In the rural churches, usually 20 families share one copy of the magazine. Darryl plans to return to visit more friends at RULE on November 26. Other opportunities to get together with former co-workers without the restrictions of workplace politics will follow. Now, Darryl has the freedom and opportunities to share his life, apologetics materials, and life with them on a whole new level. Darryl at the Royal University of Law and Economics (RULE) for the first time since 2011. Opportunities For Darryl to Share the Gospel with Non-Christian Cambodian Friends As Result of His Mom’s Death. Even though Darryl wasn’t able to go to his mom’s funeral in Missouri because there wasn’t time to purchase a plane ticket and fly there, Darryl still was able to connect with his family. Darryl’s brother, Donald, read a message from Darryl and Darryl’s sister, Rachel, read a message from Kayo at the funeral. Darryl also made a video tribute about his mom for his immediate family, and Darryl’s cousin sent him a few video clips from the funeral. So, Darryl felt connected. Since then, Darryl has been able to have two good, long phone conversations with his Dad, who is doing very well. Soksan, the Editor of Light Times Magazine, translated an evangelistic Facebook post for Darryl regarding the death of his mother and how as Christians, death is more like a graduation from a school. We miss them, but we know that they do not want to return from heaven to return to the difficult school called life. Many of Darryl’s non-Christian former colleagues and students responded to the post. Sinath, one of the students in Darryl’s Advanced English Class at RULE from 2007-2009 (who also tutored Darryl in Khmer, visited us when we lived in Kampong Chhnang, and who now works for a company that insures aircraft) came to visit Darryl soon after his mom’s funeral. Darryl was able to share his faith with Sinath on a new level because he could talk about how he missed his mom, but that he had hope to see her again. Darryl also gave Sinath a couple of issues of Light Times Magazine. There have been other wonderful opportunities to share his faith with our landlord, and the Cambodian husband, a professional musician, who is married to one of Kayo’s non-Christian Japanese friends as part of Darryl’s remembrance process of his mom’s life. More Translators, Narrators, and Video Production Partners for International Fishers. More highly skilled translators are volunteering to translate Darryl’s Apologetics Video Scripts and Cambodian Language Blog Articles. Mek, Darryl’s long time translator, has been very busy with much needed extra work. His wife just had their second baby and so they need more income now. 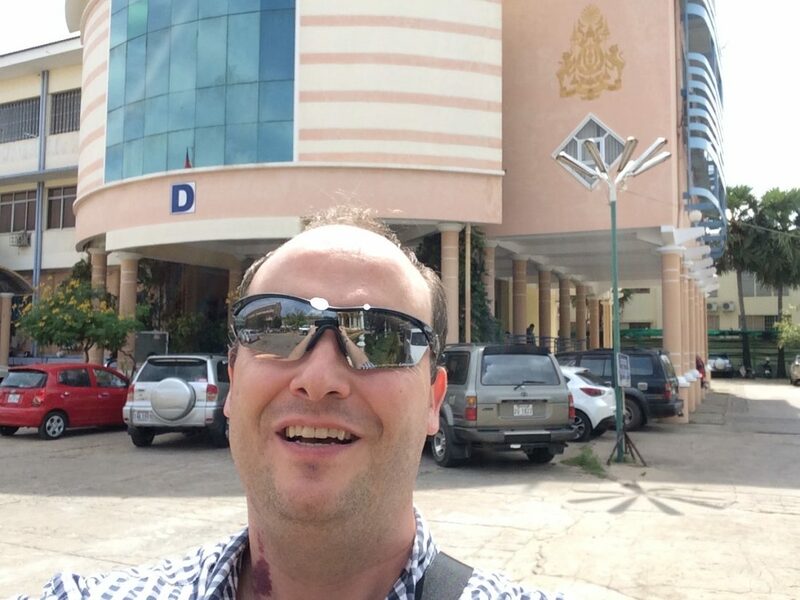 Mek, has been recording all of Darryl’s Cambodian language video scripts in his house. However, now with the new baby and a 4 year old, he cannot find 10 minutes of silence necessary to make a good recording without a baby crying or some other noise :-). So he has taken a break for a few months. But, God provided a new partnership with Veasna and Mary, two young Cambodian Christians who have a Cambodian Language Video Ministry Called True Media. They are willing to narrate Darryl’s videos and now, Darryl can have video narration instead of only audio. Other projects are in the process. 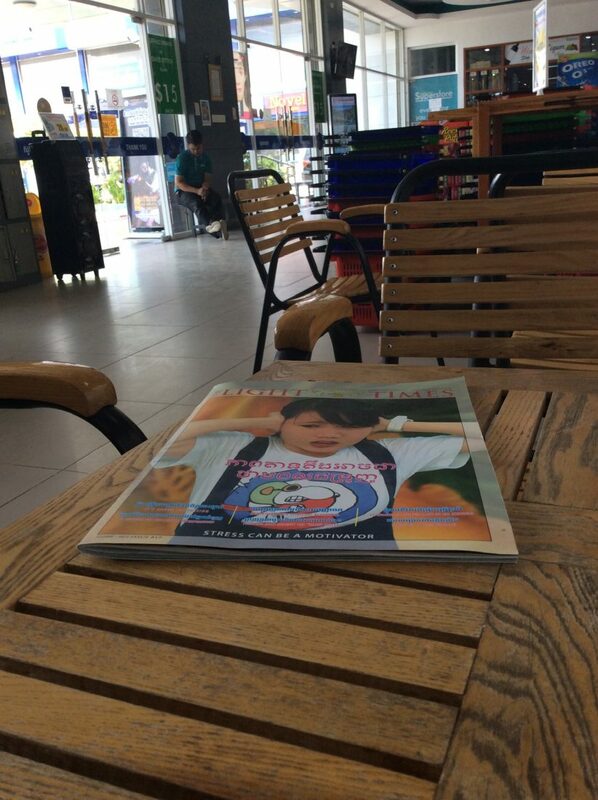 Now the Cambodian language blog articles go out via Facebook and other social media platforms to more than 30,000 Cambodians. The website, www.internationalfishers.com has increased its traffic from a little over 1,000 unique visitors per month to more than 1,600. Benjamin’s teacher, to help the Christian home children in the school to become confident in the truth of Christianity and the Bible so that they will not leave the church when they leave home to go to the university or start their careers. A Japanese missionary couple who lead a children’s ministry in a Cambodian Baptist Church. The Director of a multi-national university student ministry. A counselor at Christian counseling center. 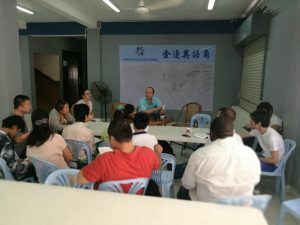 Kayo’s Ministry to Japanese Living In Cambodia. Kayo’s Japanese Life Group ministry is increasingly active, even though it is only a monthly meeting. One Japanese Christian family, who are not missionaries recently went through a major crises. The husband, a manager at a factory in Cambodia had serious health and burn-out related problems and had to resign his job and return to Japan for treatment. The wife and two young children could not close down their apartment, sell their belongings, wrap up the older boy’s education, and find a place to live, job, and new life back in Japan that fast. So, the wife and the two children have had to stay in Cambodia for a month or so before returning to Japan. The company stopped subsidizing the family’s expensive apartment, so we helped the wife, kindergarten aged son, and two year old daughter to rent and move into a low priced studio apartment in our building. 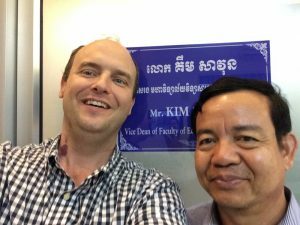 The situation is quite complicated so Kayo has been helping to arranging counseling and therapy for the family both in Cambodia and Japan. Darryl has been giving the boy a ride to and from school along with Benjamin. Darryl’s Health Problems and Amazing Recovery. By now, most of the readers, including the writer (Darryl) are thinking. You guys really need a vacation! The ironic thing was that in the midst of all of this drama, we actually took about a week of a “staycation” (no work, relax, swim or bicycle with Benjamin) the week of October 7th. We really needed the rest in order to prepare us for what was to come. Kayo had several days on and off of exhaustion and various minor illnesses. On October 13, Benjamin had to go to the hospital to be treated for a severe eye irritation. One week after my back pain started. I was already feeling better. and back pain. He took a sick day and thought he would get better. The next day he got worse from both conditions. By Friday afternoon, he could barely drive the car without nearly screaming from the back pain every time the car went over the numerous bumps to and from Benjamin’s school. He could only sleep 3-4 hours per night, rolling over or getting out of bed was agony and he could barely walk. Combined with the severe intestinal problems, he was miserable. Of course Kayo got exhausted too because Darryl disturbed her sleep when he had to get up in the middle of the night and try to get a little more sleep propped up on the hobbit sized sofa. Even though Darryl wasn’t able to help the Japanese family move to our apartment building, Kayo and two strong church men from Fiji stepped in and helped out. Darryl still was able to watch the kids during the Japanese Life Group and even though he couldn’t teach English at the English class at church, he could still attend. Two weeks after my back pain started, I was back to normal activities, with only a little pain which continues to go away gradually..
drive himself to a nearby hospital to get checked out. Benjamin had a holiday from school so Kayo had to stay home with him. The car battery was dead. So, Darryl took a tuk tuk taxi to the hospital and arranged for our long time friend and Christian mechanic to come to the apartment and replace the car’s battery. At the hospital, Darryl had complete lab work done, an abdominal ultrasound, and a back X-ray done. One doctor couldn’t find any specific cause of the intestinal problem and wanted to do more tests but gave Darryl some medicine for the symptoms in the meantime. 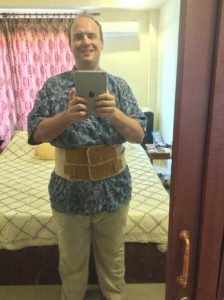 The orthopedic doctor diagnosed Darryl with scoliosis (curved spine), prescribed some heavy duty pain medicine and a back brace. When Darryl asked if there were any additional treatment options, the doctor said, “No.” Darryl returned home by tuk tuk around 3:30 pm, and despite the brace and the medicine his pain was only decreased by 10-20%. 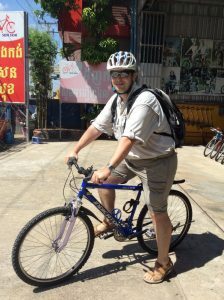 The good thing is that a fellow missionary saw, Darryl’s prayer request on Facebook and recommended a Physiotherapist. Darryl contacted them and was able to get an appointment for the very next day. During supper, Benjamin suddenly felt nauseous and suddenly got, “sick” right in front of the bathroom door! Benjamin couldn’t clean it up. I couldn’t bend down to clean it up, because of the back pain and Kayo was too exhausted from caring for Benjamin, myself, and running the house and an intense ministry weekend that she couldn’t move quickly. Just as she started to clean up the mess, the water pump in our apartment broke and we were without water for 18 hours. Kayo could only clean a little bit with wet wipes. Needless to say it was a miserable night. Early the next morning, Darryl went across town in the car, leaving a sick Benjamin, an exhausted Kayo, and a smelly apartment behind. It worked out the Physiotherapist clinic was located close to the Christian mechanic shop so Darryl took the car for repairs and them made his way over to the Physiotherapy clinic. By God’s grace, the Physiotherapy worked! After the first session about, 80% of the pain was gone! After a few more sessions, nearly all the rest of the pain is gone. The intestinal problems also went away. Exactly two weeks after the pain first started, Darryl was back to regular activities and was able to ride his bicycle again. He continues to do stretching and strengthening exercises and will return for a follow up appointment on November 26. Celebrating 14 years of God’s faithfulness in our marriage and family. update, we said that we were in a financial emergency situation. We thank God that situations changed and new sources of funds came in and we are no longer in an immediate financial crisis. However, we really need your prayers regarding our financial situation, because this is an area of great vulnerability, especially during a time of intense ministry. Darryl’s Medical bills look like they will cost around $1,000. Our health insurance has a $750 deductible and we are not sure how much/any of the physiotherapy treatment will be covered. On October 16th, Kayo and I celebrated our 14th wedding anniversary with a nice lunch. Afterwards, when I tried to withdraw money from the ATM machine, the ATM machine malfunctioned and refused to release the ATM card. This card was the only card we have for one of our two accounts (ministry and personal) that we have in Japan.) When I called the bank, they would not send anyone to help so we could not get the card back for two weeks. As a result, Kayo had to report the card missing and so the bank in Japan deactivated it. We probably cannot get a replacement card for this account until January when a pastor from Japan is scheduled to visit Cambodia. This adds a little more stress and complication to our lives. The ATM machines used to give us $800 at a time with out any additional charge. Now they charge $5 and only allow us to withdraw $400 at a time. 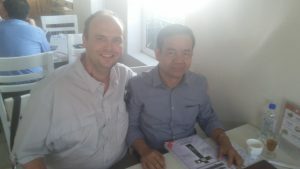 In January the Cambodian government will begin charging a 10% tax on top of our $400 monthly rent. We cannot really downsize too much more to save money because we currently live in a one-bedroom apartment and Benjamin sleeps in the living room. Eventually, we probably need a two bedroom apartment, so this is a concern. Due to the changes in the laws related to our visas and work permits we will need to pay nearly $900 for visas between December 2018 and June 2019. We will also be required to pay another $600 for work permits for Kayo and myself. We are concerned about the funding for Benjamin’s tuition which is more than $500 per month. We are also need to start saving up some funds for Benjamin’s return to the US to start college or a career in a few years. We also need to start saving for retirement again. We haven’t been able to save anything for several years. But we praise God that we have remained completely debt free. I do not share these things to pressure you to feel like you are required to meet these needs or solve these problems. That is God’s responsibility. Our responsibility is to pray, trust, and obey. I just needed to write these needs down so that they can stop taking up space on the tired hard-drive of my mind and so that when God meets them, that we can join together and praise Him. He has always been faithful, even with bigger challenges than these. Thanks for your faithful prayers, encouragement, and partnership. May God continue to bless you! There is more that I could share, but I am getting tired of typing! Thanks for reading this long update! Posted on November 13, 2018 Author Darryl RecordCategories UncategorizedLeave a comment on A Season of Breakthroughs… with Tribulation, Intense Blessings…and Pain.